I am wondering around the forum to find ways how virtual tours can be put on mobile devices (in this case iOS) for offline viewing. So far I have seen and tested only Goodreader App, which is great app for myself for its low price and functionality. The good things about it are that it is working and fairly easy to set-up, but I am not so satisfied with User Interface and User Experience. I was thinking about putting tour on our clients iPad via GoodReader App, but abstained from doing so because it just don't look professional. Ok, there is another way - to create a native iOS application for the tour, but almost all of my clients are not willing to pay for that (in my area there are only few professional iOS developers and they charge a LOT). Am I the only one who is not satisfied with only these two options being out there for browsing tours offline and giving to clients - GoodReader and native iOS app. Are you familiar with other apps/techniques/hacks/ways for iOS that allow viewing tours offline and might be something between GoodReader and native app? Does your clients ask about offline viewing of tours on their mobile devices? How much would you pay for this app (displaying some archived panoramas) ? Hi, Have a look at HTML Books. Very simple to use, just zip up the output folder from pano2VR, rename the html page to index and away you go. Tested out HTML Books! UI is far better than GoodReader, but it lacks some great functionality of GoodReader. For example, you cannot hide the top menu - lock-in the viewer. There are a couple of other things that I personally would like to have, but those are also not on the GoodReader. In fact, those things might be something over the top of the average VT creator. I am starting to think that the only such App that would suite me would be App created or ordered by me.. But then again, it takes a lot of time and money. However, I wonder if I am the only one of the VT creators that lacks such a specific App. What do you guys think, should there be a Great App for viewing tours offline on an iPad and other devices? So to say, if there is Demand, then there will be Supply that meets that Demand.. If I understand you correctly, MacHeld, you are on the same page as me - you also would like to have this App. Regarding price for such an App, I would say that creating it custom just for my own usage would be too expensive. Does 'putting' mean you have access to their devices in order to load the tour or do you intend to post a tour on server or other remote location that they would then download to their devices? but abstained from doing so because it just don't look professional. When you say it doesn't look professional are you talking about the GoodReader document structure where all of the files contained within the folder are visible or the actual GoodReader interface that is displayed when a tour has loaded? There is an alternative application called Document 5 by Readdle that is similar to GoodReader but a bit of a simpler interface, the following illustration shows the main document screen, individual folder, normal screen, single tap to hide UI screen. As you can see it's a much cleaner screen. Documents can be downloaded as zip files from iCloud, the Web, or sideloaded from iTunes. Alternatively you could go to the next stage and build an app that can be given to your clients to load onto their devices using PhoneGap. This requires a little bit more application support such as an Apple Developer Account, but provides you the option to create branded apps. You can find more information on PhoneGap at http://phonegap.com/. If you are a paid user of Creative Cloud you can have up to 25 free apps at any given time. Here is an quick Pano2VR project that I just used to create a PhoneGap app. Took about 5 minutes. I am a paid user of creative cloud, what do you mean you can have 25 free apps at any given time, is it tht they develop it for you? Or is it that you get some space to store your apps for free? It means you can build up to 25 apps at any given time. When you build your app using PhoneGap you add it to your dashboard, when you have 25 apps built and residing in the dashboard you cannot build anymore unless you pay an additional amount. Here's a shot of the dashboard..so I can build 23 more apps. So let's say you build an app for a specific time period, once the app is no longer needed you delete it and it means you can build a new one. 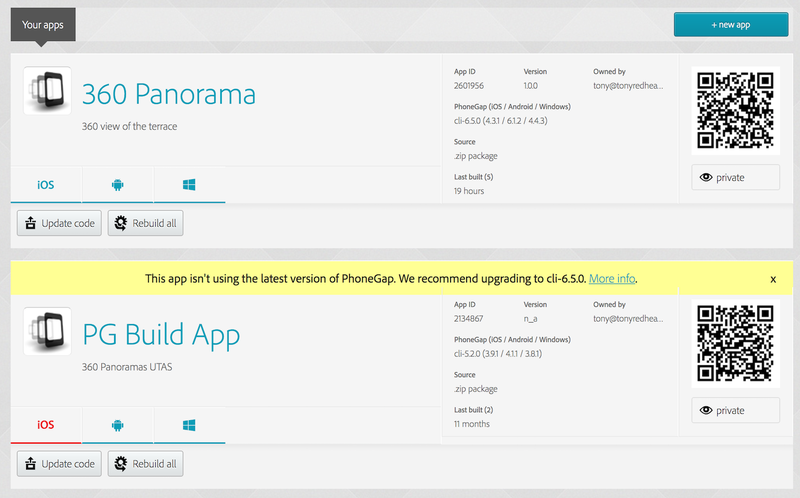 Hello Tony, does PhoneGap allows building Apps for the GearVR? Im not a programmer, is it difficult to use the program?